Understanding the anatomy of a sports injury may not seem important if you aren't in the medical field but the more you know about your injury, the better chance you have for a quick recovery. Learning the difference between a ligament, a tendon, and a muscle can not only help you better understand your injury, but it will also be helpful when trying to determine what kind of injury you may have. Below you will find links to the various regions of the body, with detailed anatomy information. In addition, I've provided a few videos that illustrate gross anatomy of the ankle, elbow, knee, and shoulder. The first step in understanding anatomy is to understand some of the terms used to describe positions of the body. To begin, imagine dividing the body in half with right and left sides. When describing body parts, they are often referenced as either medial or lateral. Medial structures would be closer to the center dividing line, whereas lateral structures would be away from the center line. The terms superior and inferior are also used. Superior indicates a structure that is closer to the head, while inferior structures are closer to the feet. Likewise, we can describe structures as distal or proximal (usually the extremities or long bones). Proximal structures are closer to the trunk, while distal structures are towards the extremities. Finally, if you divide the body in half from front to back, you then have either the front, or anterior side, and the back, or posterior side. The body is made up of a lot of different tissues. In sports medicine, we usually deal with musculoskeletal or orthopaedic injuries. The primary tissues that are involved include bones, ligaments, tendons, muscles, fascia, nerves, and other soft connective tissues. Bones - these are calcified tissues that provide support and structure to the body. When a bone is broken, this is called a fracture. Ligaments are soft connective tissues that attach one bone to another. Ligaments may be distinct bands of tissues, or they may be thickened areas of a joint capsule, such as in the shoulder. Injury to a ligament is called a sprain. Tendons are soft connective tissues that attach muscles to bones. Most tendons are named based on the muscle they are connecting, like the hamstring tendons. Since tendons are intimately related to muscles, tendon injuries are usually called strains. Muscles are the contractile tissues of the body. They have special properties that allow them to change their length, producing movement. 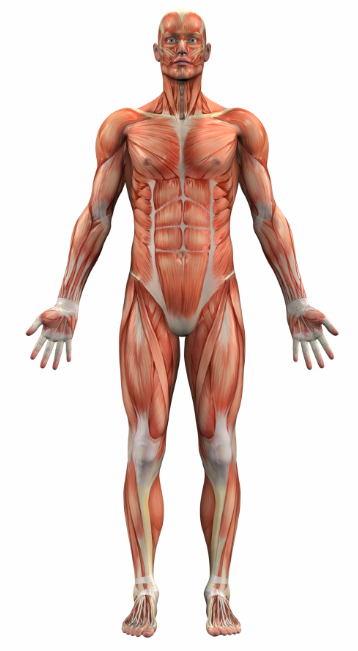 Muscles are built in multiple layers, with each layer surrounded by a soft connective tissue sheath (perimysium, endomysium, epimysium). These connective tissue layers help give muscles shape and form, and come together as the tendons attaching the muscles to bones. Muscle injuries are called strains. Fasica is a soft connective tissue that surrounds muscles, bones, and other soft connective tissues. Think of the fascia as a continuous net of tissue that runs throughout the entire body. Fascia helps to connect the different body regions. Nerves are special tissues that help to transmit signals throughout the body. Nerves begin at the spinal cord and then course through the extremities all the way to the ends of our fingers and toes. Nerves carry signals both from the periphery to the brain and signals from the brain to the periphery. Signals coming into the body include sensations of pressure, hot, cold, pain, movement, and position. Signals going out from the brain are used to control muscles. Learn more about the bones, ligaments, and muscles of the foot and ankle. See what structures are injured during an ankle sprain, and learn more about how everything works together. Learn more about the bones, ligaments, and muscles of the knee. 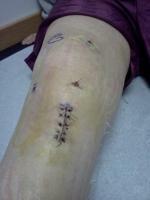 See where the ACL, MCL, PCL, meniscus, Patella, and tendons are, and learn more about how everything works together. Learn what structures are involved with impingement syndrome, shoulder dislocations, and labral tears. Find out exactly where the rotator cuff is, and what its job is. Bones, ligaments, muscles, and tendons are all hear. Learn more about the bones, ligaments, and muscles of the elbow and arm. See the structures that are involved in common elbow injuries, and learn more about how everything works together. Learn about the muscles, bones, and ligaments of the hip. These structures are not only important with hip injuries, but can also play a big role in treating other injuries like patella femoral syndrome and tendonitis. Learn more about the muscles, bones, and ligaments of the wrist and hand. See what structures are involved with common sports injuries, as well as how everything works together.